Peering under the covers on the new white baby grand that will have its debut on July 30 at the grand opening service of the new Mt. Canaan sanctuary. Rev. George L. Brightharp, Pastor of Mt. 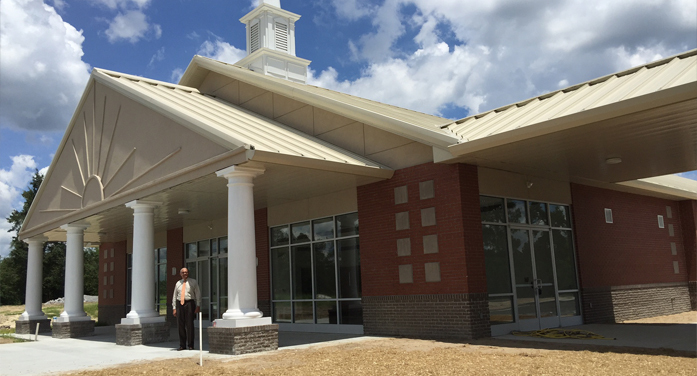 Canaan Baptist Church, was sure about one thing he wanted for the new sanctuary of the church, recently built and to be opened on July 30 in a special service. “The walls are white, the pulpit furniture is white, why not a white grand piano?” – and a new one at that. An interview with Rev. Brightharp on July 12 was for giving the readership a chance to know about the handsome, new (and big, 12,000 sq. feet) building which has been under construction for almost a year now, and will be ready for worship services this month. Among its features are women’s and men’s lounges (separate) as one enters the vestibule; modern pewter chandeliers that overhang the spacious sanctuary; beautiful, long pews with cushioned seats and backs that are the color of the oak wood; expanse of deep blue carpet under foot; large window openings that bring light in; and a baptismal pool behind the choir and pulpit. There, opposite the pool at the other end of the sanctuary is a room with see-through windows where the audio visual equipment will be — $74,000 worth. This new sanctuary is a magnificent structure that has been hoped for, for years. But because the church is so highly invested in its youth, the large gym, that is the balancing arm to the horseshoe-designed campus, was created first. There was a hurry to get it paid for, and in 15 months in order to take the next step and make ready a new sanctuary for a historic congregation – descendants of the early church founded by Alexander Bettis. Mount Canaan is nearing 150 years old. “Our young people do not know who they are,” he bemoans, as he talks about what his inspiration was for the church building. “They don’t know and don’t appreciate their history.” The pastor (A. Bettis) who started this church also started “the premier private school in the state for blacks,” he continues, and it is this history that he worries may be lost to the young. Brightharp says his mission for the church, under the guidance of the Almighty, was to have a place of quality to worship, to exercise (the gym), and to pursue social and spiritual endeavors in case, in the future, the economic opportunities are not there for them. He notes that he came there 38 years ago thinking he would remain 5 years, but is in his 38th years as pastor. This sanctuary fulfills the plan that he saw as his mission while the pastor. The campus now holds the earlier (built in 1962) sanctuary which the congregation has outgrown. (The earliest church building was across the road on land adjoining the Woodrow Padgett land.) It will be there for Vacation Bible School and Sunday school. There is a fellowship hall that holds an office and a kitchen. A second kitchen is in the gymnasium. This new, splendid building, which can hold 600, is there for worship, for weddings and for funerals. How proud the membership must be! Now the pastor and congregation are looking toward the week of the “Grand Opening” to which the public is invited: “Everyone is invited to attend,” Rev. Brightharp says. As for the Mt. Canaan congregation, Brightharp notes that numerous master’s degrees and doctorates are sprinkled throughout the membership, along with 5 physicians. “For a country church, as I see it, we are an educated group with a rich history.” One year, Rev. Brightharp remembered, the church produced 30 high school graduates and 29 went to college and one to the US Navy. The pastor himself has been schooled at N.C. A & T for a BA and MA; more graduate studies at USC and Atlanta University. On July 30, at 10:00 a.m., Rev. Brightharp will be the minister in charge for the opening service. 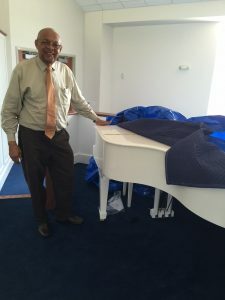 He promises music from several groups: “Old Macedonia Men’s Group will be performing for sure.” The Music Director for the church is Lionel T. Williams. Vernel Williams is one of the pianists for the church services. A revival will follow, beginning July 31, at 7:00 p.m., with the special speaker at the first service being the Mt. Canaan Assoc. Moderator Rev. James; on Tues., July 1, Old Macedonia Baptist Pastor Limuer Meyer, from one of the first churches that founder Rev. A. Bettis started after Mt. Canaan, will speak; the first congregation to leave Mt. Canaan was Shaws Creek church, and their Pastor Rev. Holloway will speak on Wednesday night; and the final night’s speaker is one who Rev. Brightharp says will bring such action through his sermon that “we may have to do repair work afterwards!” – Rev. Charles Goodman from Tabernacle Baptist in Augusta. “All are welcome,” is Rev. Brightharp’s invitation. And among the members who have helped to bring this grand opening to the community are the following leaders of the church: Chairman of the Deacons Otis Griffin, Chairman of the Trustees (an incorporated church) Willie Knight, Sunday School Superintendent Ann R. Williams, Church Treasurer Michael Garrett, Church Clerk Janet Gordon, and Church Secretary Willa Lanham.